Directory Opus 10 requires a minimum of Windows XP SP3 (or SP2 for the x64 edition). At the time of writing, those are the oldest versions of Windows which Microsoft themselves still support. This program requires Service Pack 3 or later on Windows XP. The operating system is not adequate for running Directory Opus. If you see either message but you are really running a later version of Windows (e.g. Windows 7 or Windows Vista) then the installer, or the program you have launched it from, must be configured to run in Compatibility Mode. See below for information on turning off Compatibility Mode. Compatibility Mode is a Windows feature. It lets you tell Windows to pretend to be an earlier version when running particular programs. To those programs, it will appear that they are running on the Windows version you specify, not the real version you are using. In some cases, this can resolve problems with programs not designed for the newer version of Windows. In other cases, it can cause problems. You should not use Compatibility Mode unless you have a good reason to; most software does not need it. Compatibility Mode is turned on or off for a given .exe file, such as the Opus installer (e.g. DOpusInstall.exe) or Opus itself (e.g. dopus.exe). If Compatibility Mode is turned on for an exe, it stays on even if you replace the exe with a newer version. It stays on even if you delete the exe, wait a month, then download a new copy to the same place. Windows remembers to use Compatibility Mode for anything with the same name, in the same place, until you tell it not to. We recommend that you do not use Compatibility Mode with Directory Opus. In particular, the way Explorer Replacement is implemented typically varies with each version of Windows. Also, parts of Opus take advantage of newer Windows features (e.g. UAC, Aero Glass, Libraries) and may stop working if Opus thinks it is running on an earlier version. If you try to install an old version of Opus on a new version of Windows and the installer refuses and tells you to get a newer version of Opus, that is happening for a reason. The installer will only block an install if there is a known problem. In other cases, the installer may show a warning, informing you that your Windows version is not officially supported (e.g. because that Windows version did not even exist when the Opus version you're installing was made), but still allow you to continue if you choose. Do not use Compatibility Mode to trick the installer into letting you install Opus; instead, get an updated version of Opus that supports your version of Windows. This is not just an attempt to get money out of you every time a new version of Windows is released; the update you need may be free, as was the case with Directory Opus 9 and Windows 7. How do I turn Compatibility Mode off? To turn off Compatibility Mode for an exe, right-click the exe and choose Properties, then click on the Compatibility tab. Everything in the tab should be off, like in the screenshot below. If anything is turned on, turn it off and click OK. If any of the checkboxes are on, but ghosted out, you need to click Change settings for all users first (which may trigger a UAC prompt). Make sure Compatibility Mode is off for the Opus installer. Also, and equally important, make sure Compatibility Mode is off and for all of the Opus program files. The program files are usually under C:\Program Files\GPSoftware\Directory Opus (type /home into Opus if you have trouble locating them). You should check every .exe file within the Opus directory, including the ones in the Viewers sub-directory. If you are using 64-bit then you should also also check within x86 and x86\Viewers. 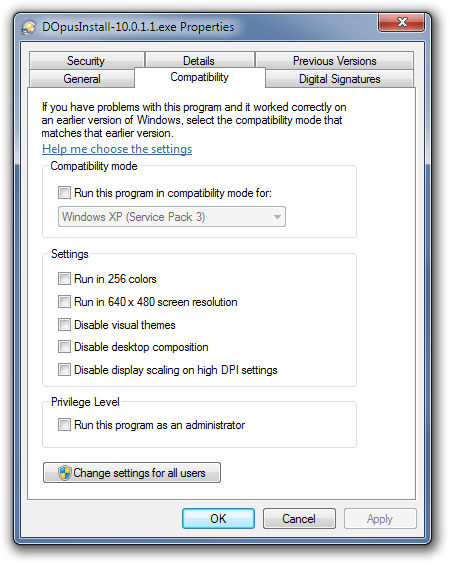 Why was Compatibility Mode enabled when I have never touched those settings before? If you choose "reinstall using recommended settings", Compatibility Mode will be turned on for the installer and it will be re-run. Anything you install in that second run may also have Compatibility Mode turned on. 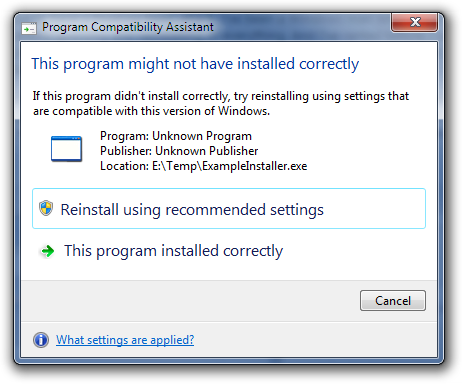 Unfortunately, the heuristics Windows uses to decide when to show the Program Compatibility Assistant are terrible (see below*) and it ends up causing more problems than it solves. If you see that message appear you should almost always choose "this program installed correctly" rather than the "recommended" option above it. Only do otherwise if there is an actual problem with the installer and only after checking for an updated version of the product you are trying to install. Newer versions of the Directory Opus installer know what to do to prevent the Program Compatibility Assistant from appearing; older versions did not and would sometimes trigger it. Recall that the Compatibility Mode settings are remembered for an exe-path even if you delete or replace a particular version of the exe. This means if they were turned on in the past -- e.g. because the Program Compatibility Assistant triggered for an old installer -- then they will have stayed on until you manually turned them off.